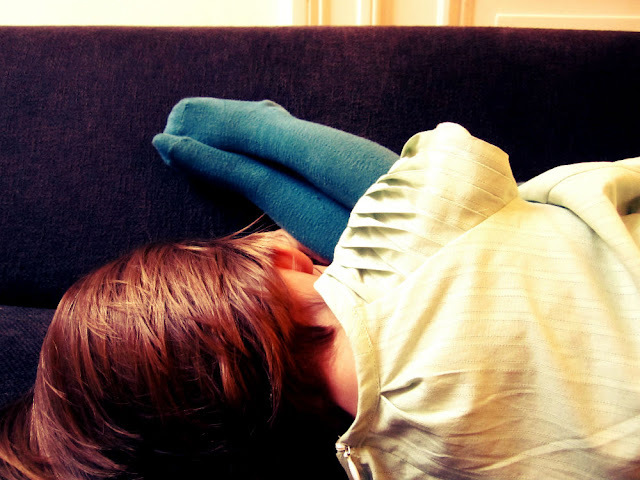 Today we have a really great guest post! I came upon An's blog a little while ago and quickly fell in love with her beautiful sewing creations and darling little girl. 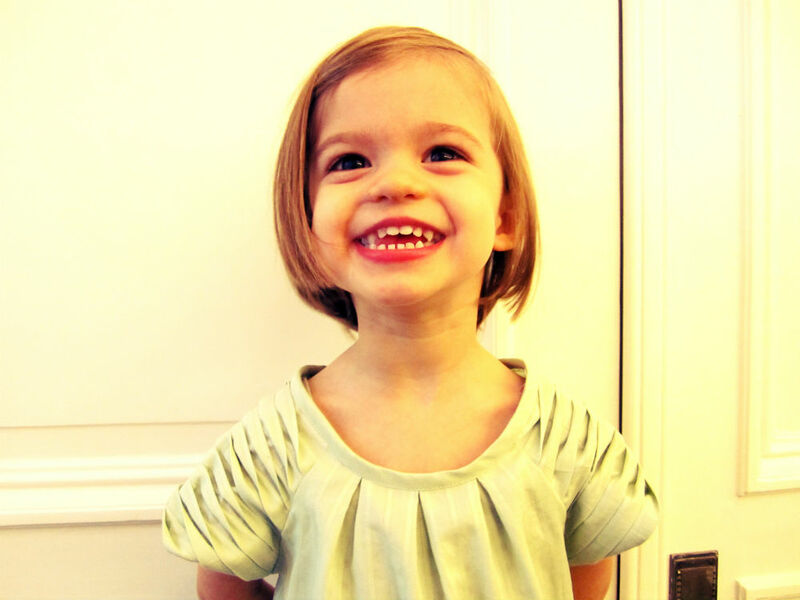 Go take a look, and be prepared to be amazed (and wish you had a daughter to sew pretty things for). Thanks, An! Hi everyone, I’m An from StraightGrain, and I’m so happy to be able to share a tutorial here at the Sisterhood! This tutorial will show you how to turn regular raglan sleeves into the ones you see in the pictures below. It’s a really simple technique, but the finished result looks quite complicated to people who don’t sew themselves, so you should get a lot of "ooh"s and "aah"s when you show them the finished dress. Let’s all agree here and now that we will never admit that it’s actually pretty easy, okay? The technique I use to create the sleeves is one which is often used in duvet covers and cushion covers: twisted pintucking. Mie of You and Mie also recently used it for her faboulous breezy top. What you start from, is an existing pattern with simple raglan sleeves (could be a dress, or a tunic). 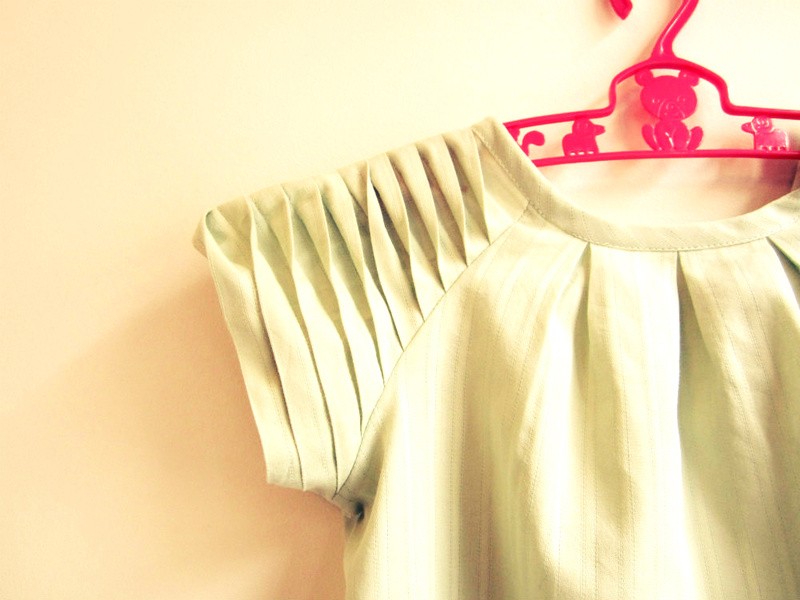 There are many tutorials for raglan sleeve dresses which have elastic in the collar, which gathers the fabric. This will not combine well with the pintucks. However, you can use such a pattern, and make the collar smaller by putting pleats in it, instead of an elastic (as I did here, for example). 1. Cut out a piece of fabric that is a few centimeters broader than your sleeve pattern, and (almost) three times as long. 2. Now, we’ll make the pleats. I used pleats of about 1 cm (0.4 inch), but you can use whatever width you like. Just a tip: if you use striped or gingham fabric, you might want to rely on the print of the fabric rather than on your ruler – it makes things even easier. As you might have already noticed, I also used a fabric with lines. Start by making the marks at the edges of the fabric. Fold your fabric with the wrong sides together, matching up every first and third mark. Stitch. The third picture below shows what the pleats should look like. Iron the pleats down. 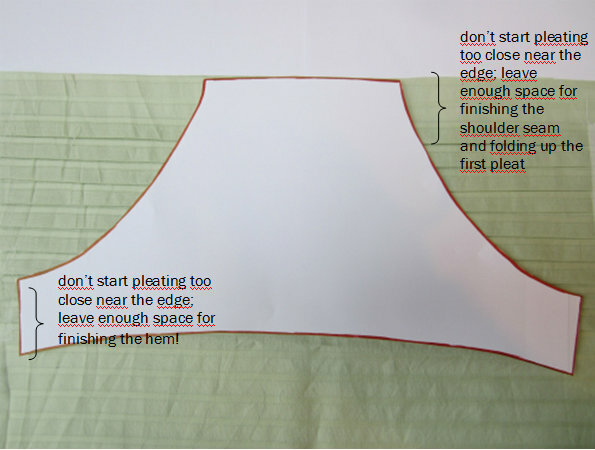 IMPORTANT: Make sure that you don’t make too many pleats! At the top (the shoulder), you should have enough space to finish the seam (e.g., to double fold inwards, or to put on bias, depending on the pattern you use) PLUS space for folding up the first of your pleat (see the pic step 4 if you don’t know what I mean). So, for instance, if you plan to use 1 cm of bias to finish the collar, and you made pleats of 1 cm, your first pleat should stay at least 2 cm from the edge. At the other end of the sleeve (the bottom) you should also leave enough space for finishing the seam. 3. 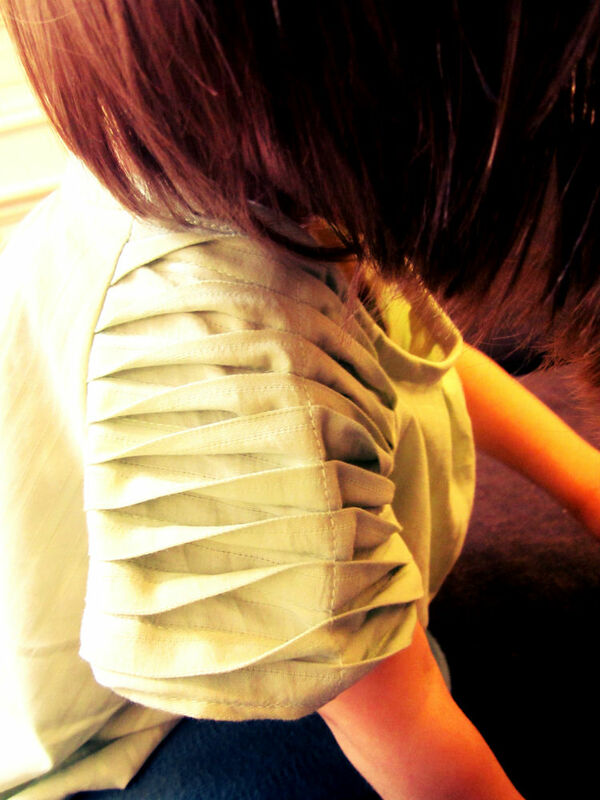 Pin your pattern carefully, and cut out your sleeves. Run some stitches near the edges of the sleeves, so that the pleats will stay in place in the next steps. 4. Now comes the fun part: find the middle of your sleeve by folding it in half, and press with your fingers. This will create a helpful little crease. Next, lift all the pleats upward, and pin. Finally, stitch a straight line from bottom to top on the crease you created. 5. 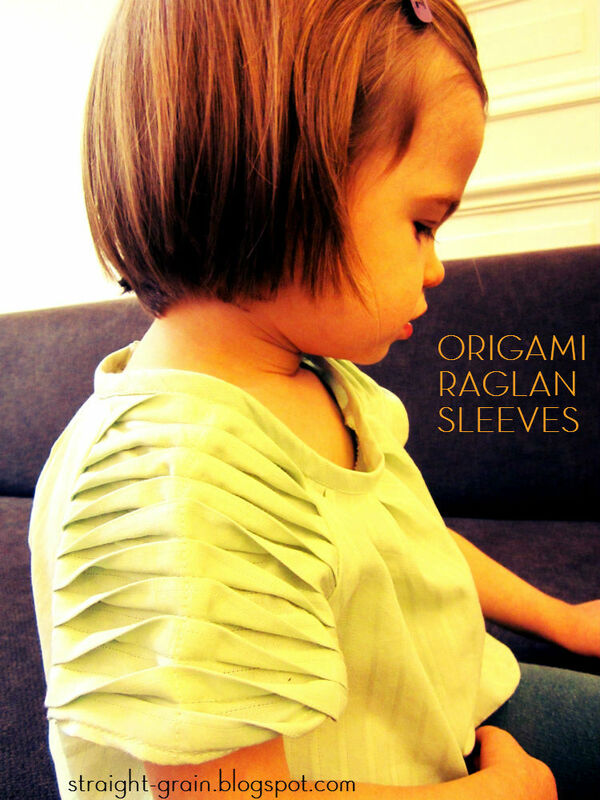 Your origami sleeve is ready! Now you just have to assemble the dress or top as you would usually do. I hope you will enjoy making the sleeves as much as I did. Thank you so much for having me, crafty sisters! Gorgeous detail and it looks simple to do. I'm gonna have to try this sometime! Thanks for the tutorial! Wow, you are so talented, they are perfect! :) I love the texture! Thanks for sharing this! So cute !!! I will try !